This photo was taken at the end of the day. Probably the number one question we had while sharing some real time progress on Instagram over the weekend was “What is a soffit for? !” A soffit (the boxed in area you see above the cabinets, sink and peninsula–basically everywhere you look–can be to disguise ductwork, pipes or wiring but they were also commonly used back in the day to just fill the space between upper cabinetry and the ceiling. I think to cut down on dusting? But these we’re empty besides the lights that were in them–that we are just going to put in the ceiling. 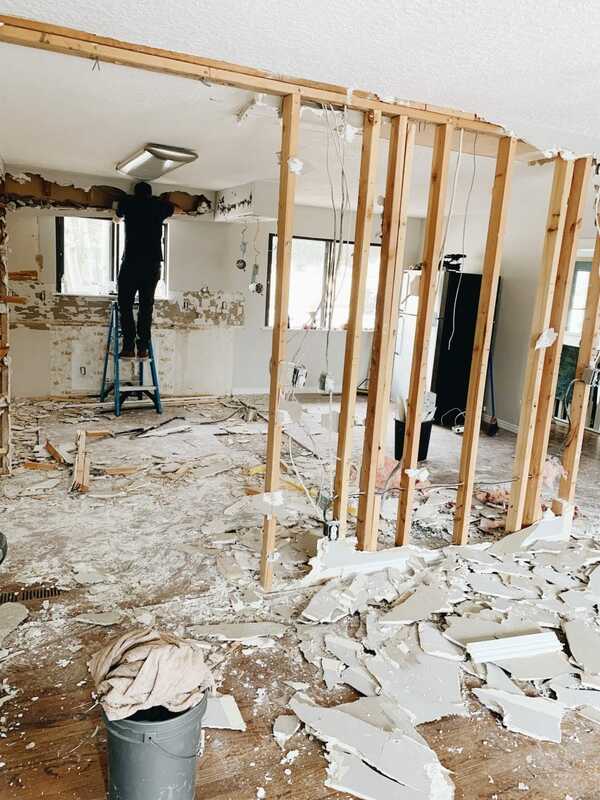 We are tearing the wall out completely between the former kitchen/dining and living room (we had three different professionals come and look at the structure to confirm this wasn’t a load bearing wall–always double check!) 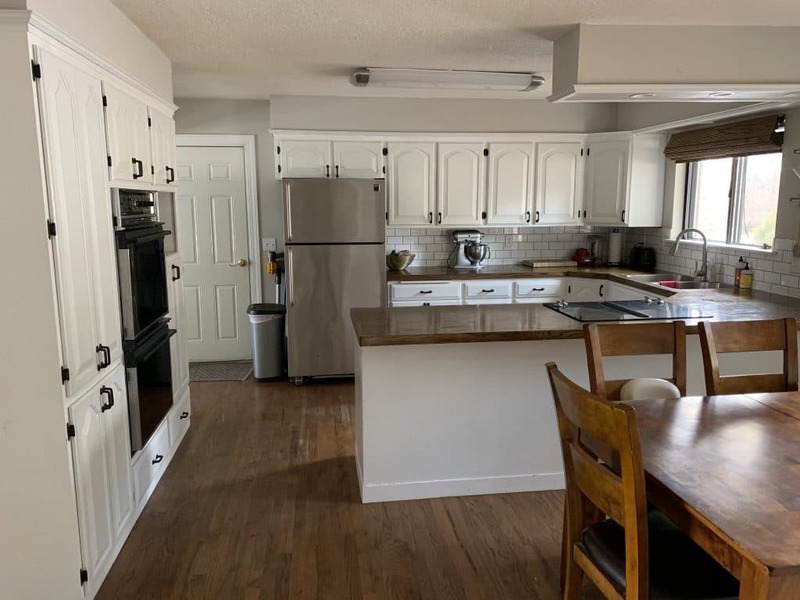 which will allow us to expand the kitchen cabinets to fill the entire kitchen side and the dining table will float between the two spaces now. We also had someone come in and identify the pipe in the studs on the right–it was for an old washer machine so we can cut and cap it!. 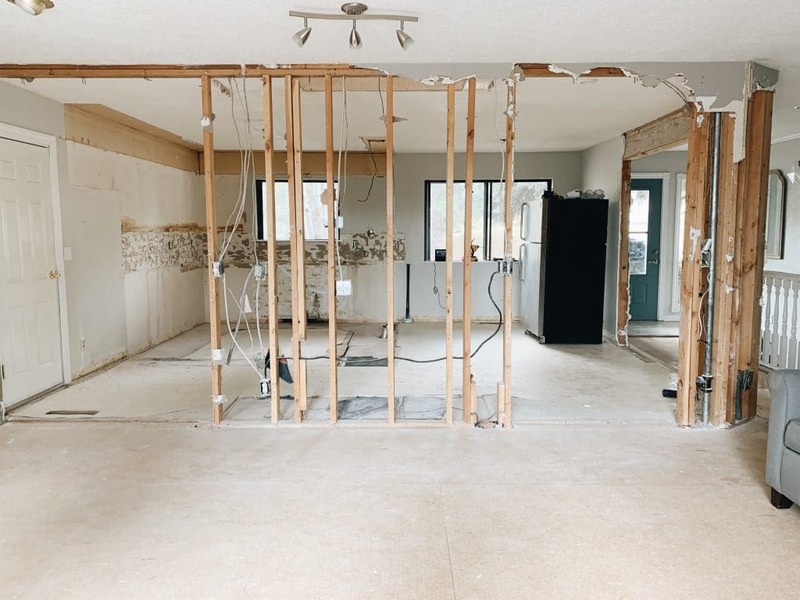 Here’s looking into the new kitchen–where the fridge is in the photo above will actually be where the new counter-depth fridge will go, which used to be where the dining room table was! We’re excited to give them a lot more space and maximize how everything flows. The right wall will close up quite a bit more (we had to remove an old pocket door frame so we could could frame the new wall out properly) so the whole corner can be opened up. Here’s an overhead shot we mocked up in the Ikea kitchen planner. A couple things are missing. Okay, a lot of things are missing. 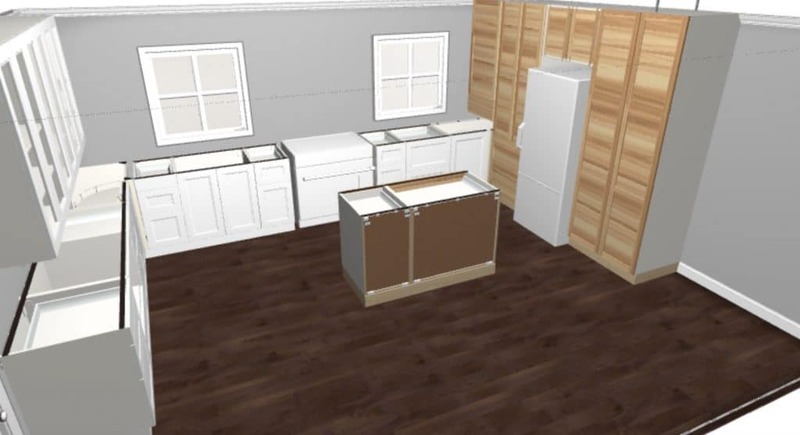 But you don’t see the dishwasher that will be in the island (so it will expand a little more to the left) or any countertops, which will also expand the footprint of the island. The range will now be in the center of the back wall (in between two identical windows) with countertops spanning either side. On the left side of the kitchen, we’re stocking them with more storage. A row of uppers (they appear with glass inserts here, but the Fullmers requested solid–so we’re doing that instead!) and base cabinets with a built in microwave integrated. 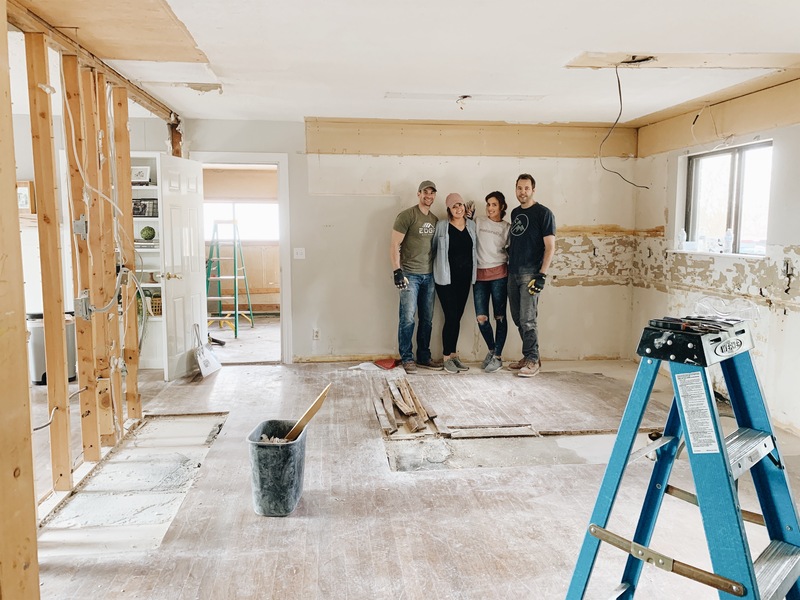 In the corner, we’re adding two open shelves connecting the cabinetry to the window wall that will match the wood of the island and pantry wall! 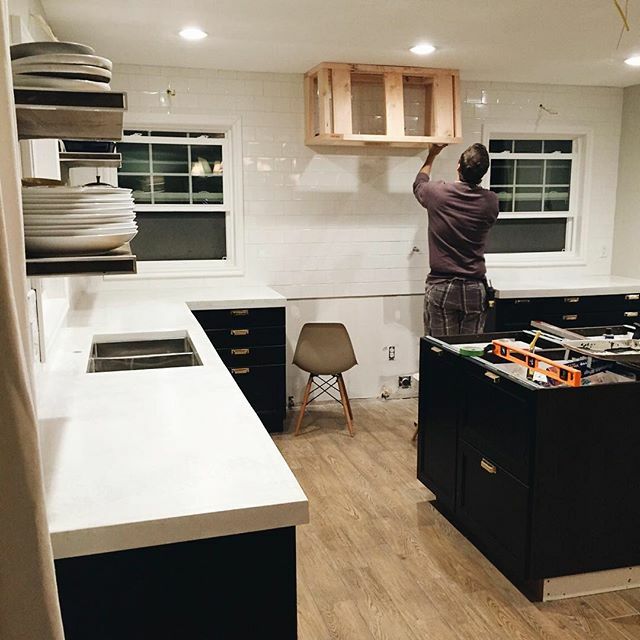 As a reminder, we’ll be using Semihandmade cabinet fronts–our own line with them in Cove (a really beautiful light wood) for the pantry wall and island and their supermatte white doors for the other cabinetry. With a clean slate, we’re ready to roll! We have a plumber, electrician and contractor coming in this week to move some things around and frame in a new window and we’re taking it from there. Can’t wait to take you along! Appliances Are Going In Today! Hi Julia! I love the renovations that you are doing for your friends. They are usually my favorites that you share! I just had a thought – if you are still looking for content ideas I would love to see more outdoor space renovations. Even if it is just styling and furniture. I live in Reno which has a similar climate to you and it’s super windy at times. I’m struggling finding furniture that looks great but is heavy enough so I’m not constantly fetching the sofa and coffee table out of our bushes. Not sure if Rexburg has the same issues. Anyway looking forward to following this kitchen renovation! We did a fun one last year! Check it out here. Love everything you do, but having grown up in a house with a similar sink/dw arrangement, I would strongly suggest tweaking the dw placement. It was so annoying! Do you know what material/color countertop you will be using? Could you tell me the color/brand of the countertop shown w/ Cove on Semihandmade’s website. The picture is also shown on your Instagram page when you launched the line. It’s shown w/ white subway tile and shelving. Thanks! We’re countertop shopping this week! I would highly recommend to reconsider the placement of the dishwasher. It should be next to the sink. This set up present and awkward workflow and will create lots of messes on the floor! Love it! Can’t wait to see how you do the tall cabinets. I’ve been looking at those with the Semi-handmade fronts for built-ins in our Rec room. What are you doing with them in the corner behind the base cabinets? They will meet the countertop! Really excited for that detail. I’m so excited to see the journey on this! Curious what computer program you use for the lay out? Thanks! This is just the Ikea Kitchen planner! 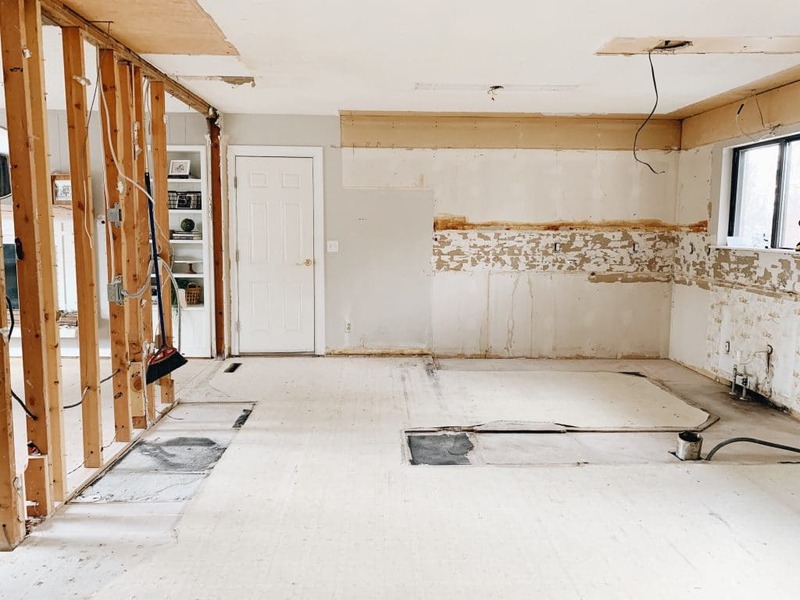 The before layout and the plans for the after are both SO much like my kitchen renovation! Crazy. Except we made the right side (where their fridge will be) a counter-height desk area and our fridge is on the other wall next to the microwave base cabinet—we have have few uppers, which I love. We also have our sink in the island right next to the dishwasher, which is the BEST. But they will save a killing by not moving the plumbing and leaving it as is. This is a really random question, but do you mind sharing the distance from their far kitchen wall to their far living room wall, if you’re able? Since my layout is identical, I’ve always felt that I can’t fit our dining table in the middle well, so I’m curious as to how it compares. I do live in a tiny Cape Cod house in New England though… Can’t wait to see this come together! The decor elements in the kitchen are clean, fresh, and sophisticated! The island chandelier though…. Why leave the gaps on each side of the range? Is that just because of the room you have and the available Ikea cabinet sizes? Will those just be covered with filler pieces? I think there is like an inch on each side that will be covered with filler pieces. This is a cool project! How great that you can open up the space – it’ll be so much more functional to get rid of that center wall especially! 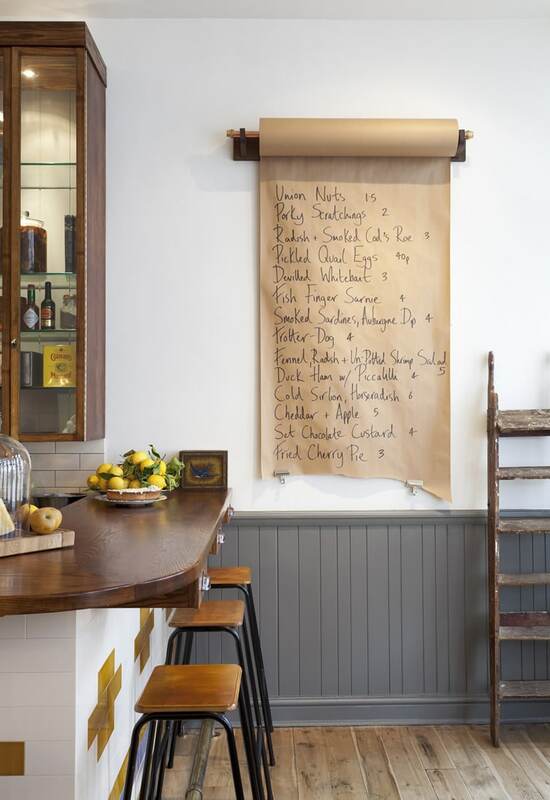 I really love the finishes – the light fixtures are wow! Also the porcelain slab for behind the range is a real beauty! (what will the counters be???) 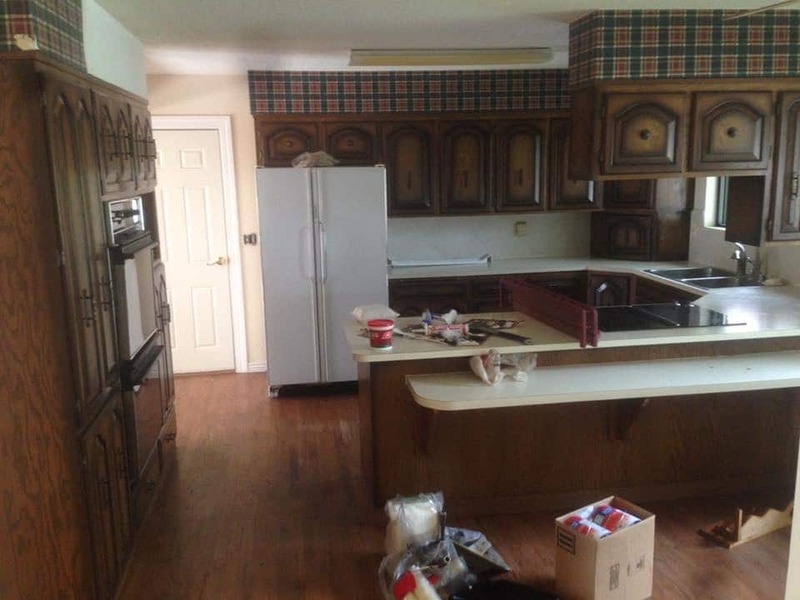 Will the hood be stainless or match one of the cabinet finishes? In the layout here, it looks like there’s 15″ between the sink & the range. Granted the island is there, but having lived the life of having my main prep area across the aisle from my sink I can say, it’s a drippy world. Plus the DW is also across the aisle – more drip-age. Plus if the DW is open, it’s in the way of someone trying to walk from the sink to the island to prep or to walk from prepping to the left of the sink to the range. 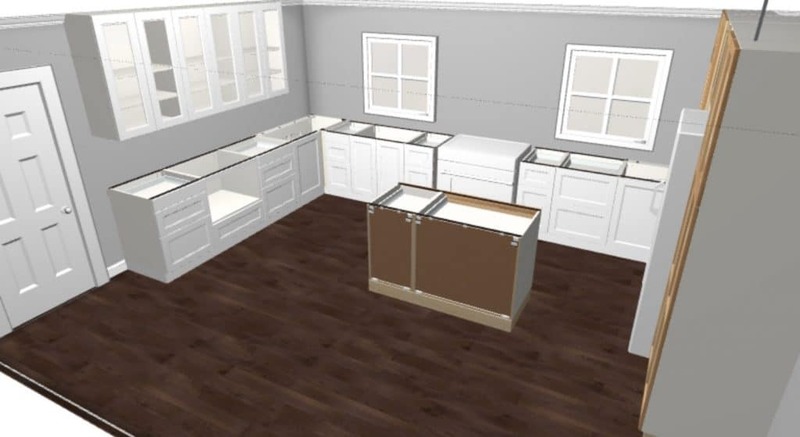 Also, another consideration is the aisle widths between appliances and the island. 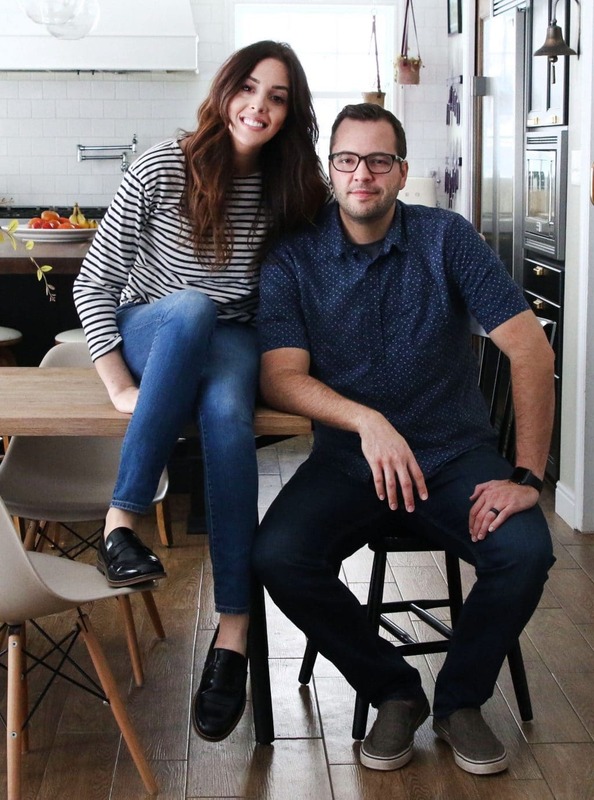 36″ is often considered the minimum if it’s a kitchen with one person walking around, 42″ is alright for two people willing to bump around one another, and 48″ is where you easily have 2 people working and can have i.e. the DW open but still easily walk by. Without knowing the measurements or how the family envisions cooking in the kitchen, it’s obvs hard to be specific. For myself, leaving the fridge where it is, I’d be tempted to either (A) leave the U-shape and do one large window across the ‘top’ wall, flanked by upper cabinets, with the sink under it, and the DW to its right, the range along the left arm of the U-shape and a ~6′ long island with some stools OR (B) an L-shaped kitchen, with the range flanked by two windows and the sink+DW in the ~10′ long island (with the DW on the far side from the fridge). Will the sink be in the island? No, the sink will remain where it is facing out the window. Are the kitchen windows facing the street? If so, will making those two windows “match” also improve the curb appeal of the house? So excited to see where you go with this Chris and Julia! I admire you both for your attitude on the “state of things.” It’s one thing to lose a house to fire, it’s another thing to lose your home AND your source of income for the next six months. Y’all are the definition of resiliency. Yes! We think so! And thank you so much for the sweet comment. It feels good to get back in the groove of things. Where is the sink going? In the island since the d/w is there? The sink will remain where it is and the dishwasher will be nearly right behind it (but not directly behind) to make it easy to load! I may be dense- but where is the sink?? 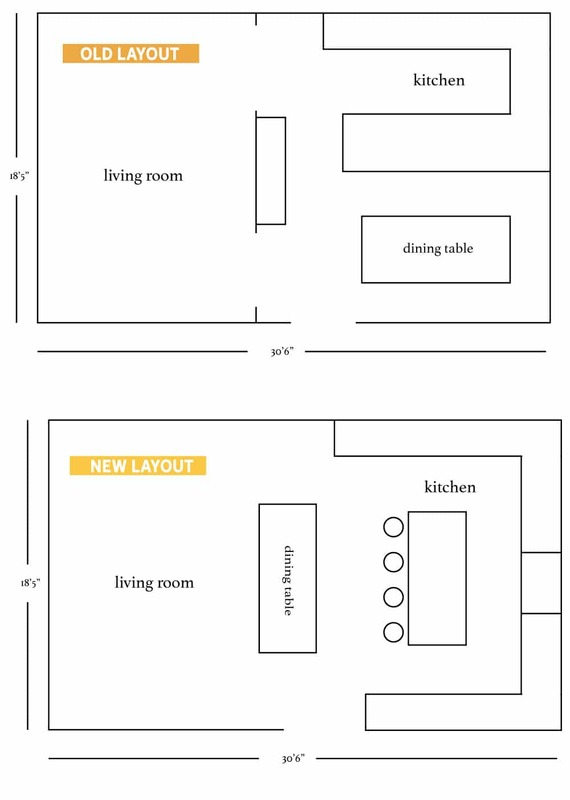 Also I’d love a post on kitchen layout basics. Walkway spacing, distance from door to cabinet, how to decide what size sink, etc. all those little mundane details that have to be decided. 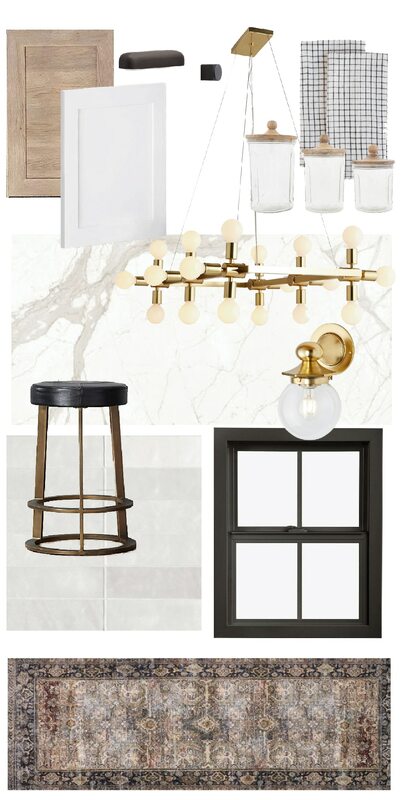 We are just starting to plan our kitchen reno (for late 2019) and the little thing have me tripped up. Also any tips for a soffit that can’t come down? Our houses our HVAC ducts. The sink will remain where it is and the dishwasher will be nearly right behind it (but not directly behind) to make it easy to load. I think a post with all those tips in one spot is a great idea–I’ll work on it! There’s lots of tips out there if you need to work with your soffit–adding trim is a favorite of mine! 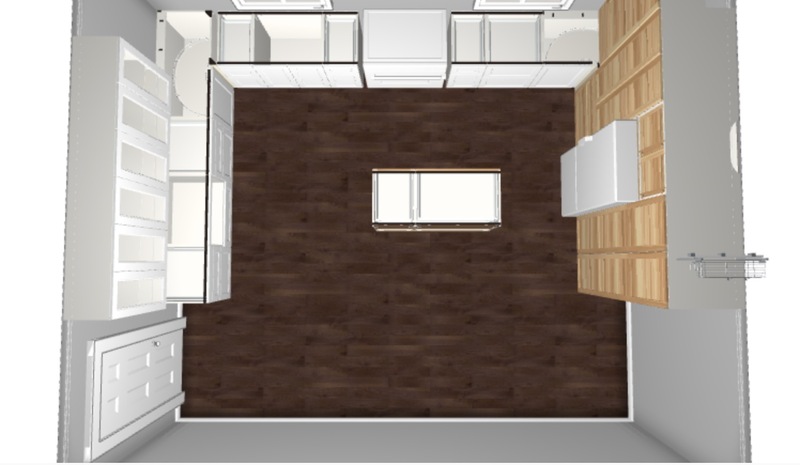 Would LOVE to see a post about kitchen layouts, flow, waking space, and clearance! Pretty please!! I would think a counter-depth refrigerator would not be big enough for the size of their family? Unless they have an extra fridge in the garage? When I remodeled my kitchen I used CliqStudios and they were able to make the cabinet around the refrigerator deeper to make it look like a counter depth cabinet. Our family of five actually prefers a CD fridge, even though it’s technically less space. In our old fridge, food would regularly get lost behind other items. In our CD fridge we can more efficiently use the space and SEE (and eat 🤗) everything in it. We do have an extra unit in our garage though, but we had that years before we upgraded to the new fridge. 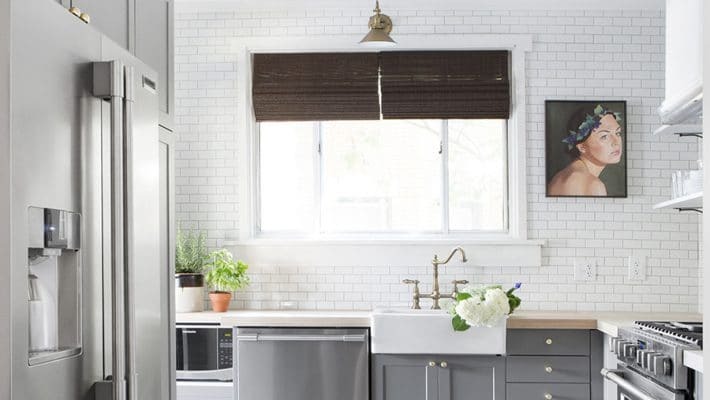 Is it weird that I love these “quick and dirty” type renovations from y’all?! Can you continue to do stuff like this?! I’m excited to see the finished result! And I’m glad you got your mojo back!